Taste of Soul Media Day & VIP Reception Gets The Party Started! The festivities begin before Taste of Soul with live performances, vendors, interviews and a gala celebration to boot! Taste of Soul is undoubtedly the largest street festival in Southern California, but the party actually starts before the big day. On Friday, October 19, Taste of Soul Media Day kicked off the fun-filled weekend with live performances, interviews and vendors at the Sentinel office and the day ended with the Taste of Soul VIP Reception, held at the California African American Museum. Taste of Soul Media Day is really a pre-Taste of Soul extravaganza but on a much smaller scale. Taste of Soul founder, Danny J. Bakewell, Sr. hit the media circuit with a host of interviews sharing the history and importance of the festival. TOS vendors such as Smokin Greens L.A., Ordinary People, Bludso’s and Hawkins House Burgers interviewed with media and spoke to the Sentinel about being a vendor at this year’s festival while sharing some goodies outside the office. 94.7 The Wave broadcasted live from the L.A. Sentinel office from 6 a.m.-8 a.m., with on-air radio personality, Pat Prescott. 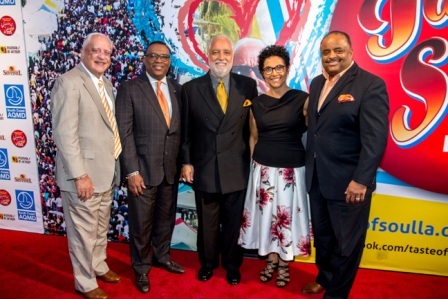 Media interviews throughout the morning also included CBS2/KCAL 9, Taste of Soul’s television partner, Fox 11, Sunwise Media, NBC and KTLA with an in-studio interview with Sentinel executive editor, Danny Bakewell, Jr. and this year’s Hyundai Soundstage host, journalist, Roland Martin. Media Day brings out the talent with live performances by up-and-coming artists. The Sentinel office was kept moving by the sounds of the Got Damn Band. Local artists Mellrozz and Aina Brei’yon performed original songs as well as popular covers on well-known songs. StarQuest Kids finalist, Auriana Chisholm and StarQuest Adult finalist, Marcio Donaldson, performed live as well. 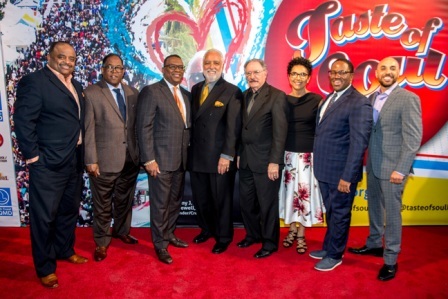 After Media Day ends, the party still continues with the Taste of Soul VIP Reception at the California African American Museum in Exposition Park for a night entertainment, good food and socializing among the Taste of Soul partners, sponsors and chairs. The Taste of Soul VIP Reception was sponsored by South Coast Air Quality Management District (SCAQMD). 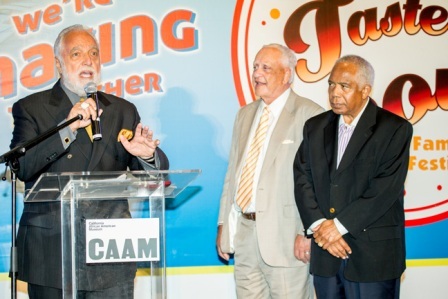 Representing SCAQMD were Chairman, Dr. Bill Burke and Vice-Chairman, Dr. Clark Parker and his wife Dr. Jeanette Parker. Hyundai who sponsored the Hyundai Sounstage at Taste of Soul wowed everyone with a beautiful display of their 2018 Hyundai Kona Limited. Don’t forget to register to win a brand-new Hyundai Kona! Guests were entertained by live performances by 2017 StarQuest Kids winner, Nancy Fifita and StarQuest Adult winner, Ryan Wirtz. DJ JiJi Sweet once again kept the evening grooving with a mix of today and yesterday’s music hits. Guests were also treated to a photo booth to capture memories of the event. The gala was catered by LeSassier Catering, who provided guests with fried catfish, chicken, salmon, red beans & rice, potato salad, peach cobbler and banana pudding for dessert. Special thanks to E&B and Signal Hill Petroleum, both of which were sponsors for catering the reception. Bakewell, Sr. and Sentinel staff welcomed and thanked partners, sponsors, city officials, organizations, notables and business executives, including Taste of Soul chairs Los Angeles Mayor Eric Garcetti, Council President Herb J. Wesson Jr., Councilman Marqueece Harris-Dawson, County Supervisor Mark Ridley-Thomas and co-chairs Congresswoman Karen Bass, Councilman Curren Price, Assemblymember, Reggie Jones-Sawyer, Assemblymember Autumn Burke, LAUSD School Board Member, George McKenna III, KCBS Pat Harvey and Ivie McNeill & Wyatt. The evening ended with a surprise performance courtesy of Hyundai by 90’s music icon, Cece Peniston, who performed some of her biggest hits. Nicole Williams contributed to this article.